All of our water tanks are high quality rotational moulded from durable, industrial strength MDPE (Medium Density Polyethylene) using the latest modern UV stabilization technologies. Our 2000 litre water tank comes fitted standard with a 14" or 16" screw down lid and a 1" or 2" BSP fitting located at the base of the tank inline with the lid. The 2000 litre water tank is fully vented for both potable and non-potable water. Also is low in height making this water tank suitable for easy filling and easy tank access for pump installation. This large 2000 litre water tanks is suitable for both domestic and commercial use including rainwater collection, manufacturing, farming and agricultural, landscape gardening and many more applications. All of our water tanks are uk manufactured in our factory from a high quality, seamless one piece mould. Design and manufacture is all done in house to ensure our high standards are met. Our 2000 litre water tank is low in height, making this water tank suitable for easy filling and easy tank access for pump installation. 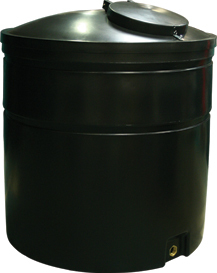 The 2000 litre water tank comes standard fitted with a 14" or 16" screw down lid and 1" or 2" BSP fitting.